The Ever Ready man definitely visited the shop where I worked throughout the 60s every week. None of the shops around here have any stock of the PP9s. Doesn't bother me, I've fitted 6-way AA holders to all my transistor radios and replenish them with a pack of poundland AA alkalines; though all my 9V/18V radios are on their original batteries! Rapid also do a PP9-size plastic box for hiding an AA 6-pack inside. I recently bought the last one they had at my local branch. It had a date code on the bottom of 07/2018. I haven't used it yet so we will have to see if it is still fresh enough to go the distance, although that's difficult to gauge with casual listening. I suppose I could do a discharge test but then what is the point of buying batteries just to discharge them by testing? I am prepared to take the risk for a couple of quid. Many thanks for this thread. I've just bought 4, mine are dated 04.2018. test OK on the "9volt batt" range on my test meter. I had another lucky purchase at the vintage/collectable shop at a local garden centre, a copy of ERT from 1962 with an Ever Ready ad on the front page. (see pic1) From this and other sources, I have made a slipcase to fit over a Screwfix PP9. Looks good in my TR 82. All I need is a picture of the bottom of this vintage style. a 1962 battery in a 50's radio is good. 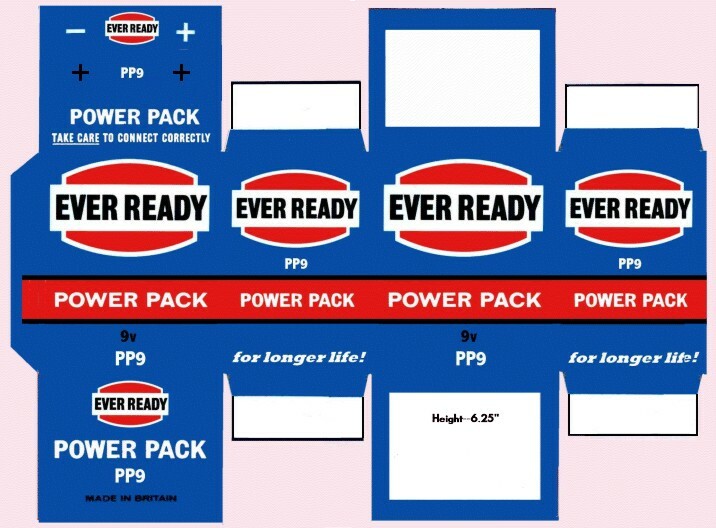 CPC are selling PP9 batteries at £2.95 plus vat of course . Would think that these will be well within the best before date ! Even cheaper and always within date are Asda AlkalinePP3 at 3.50 for a pack of two. ... or go to Poundland and get three Kodak alkaline PP3s, also well within date, and 50p change from your £3.50! How does the capacity of an alkaline PP3 compare with a zinc carbon PP9? Even alkaline PP3 batteries don't seem to last long in radios designed for the PP9 and some kind of adapter is required. The PP3 is readily available at ok prices. The same is not true of the PP9. Can't find Tim's £2.95 (ex VAT) PP9 on CPC's website so perhaps it's only available in the Preston store or maybe I've just not managed to manipulate Google correctly. I still think Screwfix's out of date stock is worth considering for immediate use. Still available at £1.94 via 'click and collect'. I have made a slipcase to fit over a Screwfix PP9. Looks good in my TR 82. All I need is a picture of the bottom of this vintage style. a 1962 battery in a 50's radio is good. i saw the batteries in their Trades catalogue i received through the post on saturday morning . like you if you put pp9 and search it came up with the full price , strange indeed. Thanks for that Tim. It looks like CPC has different pricing policies for trade and retail business. Just to clarify, CPC have special offer leaflets that are sent out every month for account holders, though you can find them on the website. The code is the same as the normal one with the suffix relevant to the leaflet added - 08 in this case. It pays to look through these leaflets when ordering just in case you miss a bargain - their intention, of course. Looks like the price has now gone back up ! "CPC have special offer leaflets that are sent out every month for account holders"
On that, CPC have just upgraded my status to trade account holder, and sent me their (huge) complete paper catalogue. I'm being flagged as a Trade Account holder, and getting their Trade Deals leaflets. I didn't request this, but am quite happy with it. Has anyone else experienced this? I am not a big customer - maybe one order per month (to bring value to above £8 to get the free postage). [Edit] - I have to say, CPC's service is excellent - I placed an order yesterday mid-afternoon, and it's just arrived today at 2.50pm - and that's with free postage!! Last edited by Boulevardier; 7th Mar 2019 at 4:11 pm. Yes, since placing an order last year I get several paper "trade" catalogues (with VAT -exclusive prices) offering different ranges of goods, every month. They do have some good deals, and very quick delivery. I don't have a trade account with them either, always paying up front by debit card. Regarding shelf life of batteries, alkaline cells typically have an advertised shelf life of 7 years from production, or about 6 years from purchase unless you get them very fresh. Zinc carbon cells are usually about 3 or 4 years from production or about 2 or 3 years from purchase. Multi-cell batteries sometimes have a shorter advertised shelf life than single cells. This is because with say 6 cells in series, there is about 6 times the risk of one being defective, if compared to single cells. Advertising a shorter shelf life counteracts this since fault rates are partly related to storage time. 7 years after production, one cell in 100 is defective, perhaps acceptable. If the same cells are instead assembled into 9 volt batteries, then after 7 years storage about 6 batteries in 100 will be defective, probably too high. So instead the manufacturer might offer the 9 volt batteries with only a 5 year shelf life. After only 5 years, the failure rate of the 9 volt batteries might be an acceptable one in a hundred, or about the same as single cells after another 2 years.